The house is sited on the dune fronting at Bundeena on the northern edge of the National Park’s southern edge. It is a fragile place, commanding a particular sensitivity from an architect. The house is raised off the ground, set on steel posts driven into the dune, braced against a north-easterly sea swell that can, at times, send a surge of energy through the dune and into the building fabric. 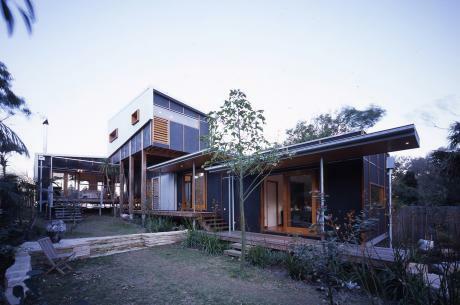 Thus, the house is designed to be both strong, and flexible - built of a composite steel/ timber frame, clad in rough sawn plywood and corrugated iron. Each room provides a framework for a different set of experiences. The living rooms are positioned on the dune ridge to make the most of the stunning view. On the beach side a breezeway room sits protected from the morning glare of the water by operable timber louvred walls - and on the bush side, an open deck sits protected from a sometimes bracing breeze. The main bedroom is perched above the living rooms, well back from the beach for privacy, commanding 360 degree views, of the beach, the bay, the bush and the hamlet of Bundeena. Another bedroom and an office on the ground floor are accessed via an open, roofed timber walkway – gently forcing visitors and occupants to experience the elements. For the owner, a naturopath, it is at once a beach house, a home, a place of work, and a threshold to the surrounding environment.